With the fame of local legend Robin Hood already well-established by 1415 it seems most likely that many men from Nottinghamshire fought beside Henry V at Agincourt. All of the great nobles present, including the King himself and his brothers, Humphrey Duke of Gloucester and Thomas Duke of Clarence, held estates in the county. 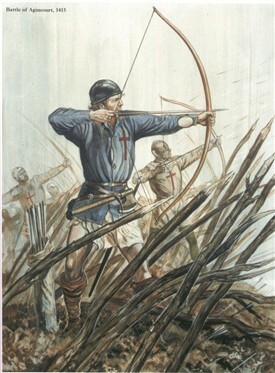 One retinue (8 men-at-arms and 24 archers) was provided by Sir Thomas Chaworth of Wiverton, though it is not clear whether Sir Thomas himself, who had recently supported the rebellious Lollards, was present at the battle. 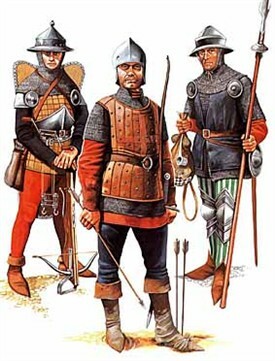 Unlike much of the French army, however, English troops were no mere feudal levy of reluctant peasants: they were professional soldiers who served under an experienced Captain and were paid a daily wage. Most of the archers were Yeomen, i.e. smallholders, not just villeins who owned nothing and worked for somebody else. Apart from the archers (who made up as much as five-sixths of the tiny army of about 6,000 men) other footsoldiers were Men-at-Arms, generally equipped with some armour (often secondhand) and a pole weapon such as a halberd. Because they were paid troops, the English and Welsh men who fought at Agincourt appear on Muster Rolls which can easily be consulted. 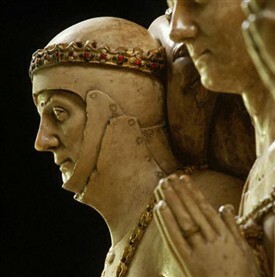 Medieval rolls usually give the man’s christian and surname, his fighting role (‘archer’, ‘man-at-arms’ or mounted ‘lance’) and the name of the Captain of his retinue. Sometimes a rank/social class such as ‘Yeoman’, ‘Esquire’ or ‘Knight’ is also included. It is by no means definite, but since surnames were a comparative innovation in the early 15th Century, any name which corresponds to that of a Nottinghamshire place almost certainly indicates that the man originated there. In a few cases ‘of’ or ‘de’ occurs between christian and surname, making it a certainty. Thus John Arnold, an archer, further described as ‘Yeoman Valettus’ [manservant], a follower of Richard de Vere, Earl of Oxford, may well have come from the Arnold in Nottinghamshire. John de Elton, another archer serving in the small retinue of a Captain Peter Legh, definitely came from a place called Elton, probably Elton-on-the-Hill in Rushcliffe. So by cross-referencing county place names with surnames on the Agincourt muster roll we get some idea of which communities can boast of having provided at least one of Shakespeare’s ‘happy few’ (Arnold has a further Richard and two Williams, suggesting a record four men at the battle). This clearly works best with unique place names, so it is necessary to discount Barton, Carlton, Clifton, Holme, Langford, Radclyf [sic], Staunton, Sutton and Weston, all of which do occur, but could refer to other places in England. 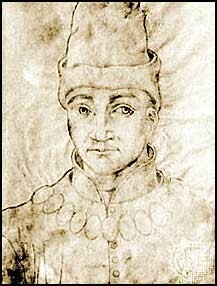 There are also several unique Notts names which appear in various surviving 14th and 15th Century muster rolls, but were not present at Agincourt, for example William of Skegby (definitely a local man) who was with Humphrey Duke of Gloucester in the 1417 Expedition to France, but had not been there in 1415. Derbyshire might like to claim the extremely interesting William Somercotes, described as one of ‘The Gromes [= Grooms] of the Chamber That was at the Battel of Egenyncourt’, i.e. a high-ranking personal servant of the King. Someone else from the Notts/Derby border was Sir Thomas Gresley, though as with his neighbour Chaworth of Wiverton, his retinue appears to have been present without him. 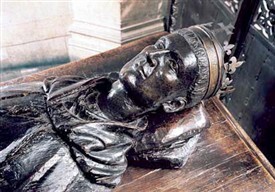 Apart from the William of Skegby mentioned above, further Nottinghamshire names that occur in Humphrey Duke of Gloucester’s 1417 expedition include Hugh Annesley, John and Christopher de Elston, Robert Strelley, John and Richard Thoresby and William Whatton. It will be seen that many of the places mentioned lie to the north of Nottingham itself and were therefore within the Royal hunting-ground of Sherwood Forest. Men from those communities may well have worked for the King in a civilian job such as forester or gamekeeper, but they, or their relatives, could still join a retinue and go away on campaign for a few months. If you come from any of the villages or towns mentioned you have some right to be proud that one of ‘your men’ was at Agincourt. If your surname actually corresponds to any of them, then you can be even prouder since you are related to, if not directly descended from, a man who fought there. This page was added by Ralph Lloyd-Jones on 26/08/2015.